Join us for a benefit concert for the Armstrong Jazz Camp Benefit Concert featuring Brass Band Traditional Jazz Artists: Kevin Louis, Anthony Bennett and Julius "Jap" McKee with performances by the 2018 Artist-in-Residnce Norma Miller and Edward "KIdd" Jordan, the Artistic Director of the Louis Armstrong Jazz Camp Faculty Band. 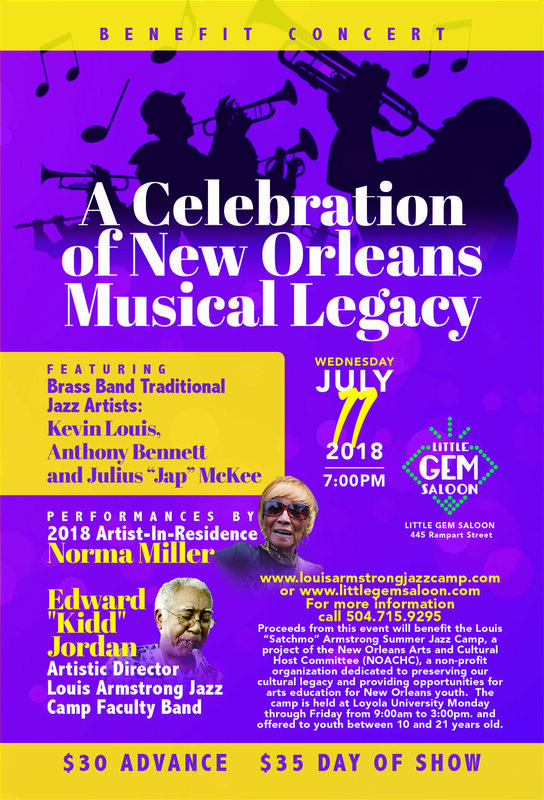 Proceeds from this event will benfit the Louis Armstrong Summer Jazz Camp, a project of the New Orleans Arts and Cultural Host Committee (NOACHA), a non-profit organization dedicated to preserving our cultural legacy and providing opportunities for arts educationfor New Orleans youth. The camp is held at Loyola University Monday through Friday from 9am-3pm and is offered to youth between 10 and 21 years of age. Concert will be in the second floor Ramp Room and elevator access is available for any who need it.